Whether it’s a father’s day poolside party or backyard barbecue, summertime is the perfect season for outdoor entertaining. While the mercury is rising, turn up the heat and flavor with grilling recipes made easy thanks to tips and recipes from Kevin Roberts, who debuts June 1st as one of ten finalists (selected from a field of 4,000) on The Next Food Network Star, a show where participants compete for their very own Food Network show. The Next Food Network Star continues to air on Sundays at 10 PM EST for a total of nine episodes. • Start by identifying the perfect mix of family and friends that will create a lively summer party. • Figure out how much food and drink you'll need for the number of people you have invited. • Plan your menu, but keep it simple. There's no need to do all the cooking yourself. If you're having more than a few guests, ask each one to bring a dish. • Food should be ready early so people don’t have to wait for it to come off the grill. • Serve a crowd pleaser. Chicken wings are the #1 appetizer on restaurant menus*. You can enjoy the great flavor of restaurant quality wings at home. With a simple two-step process: just grill your wings and toss them in Frank’s® RedHot®. Fresh, saucy, crispy! Or serve that familiar Buffalo flavor in Buffalo Burgers by adding Frank’s RedHot to ground beef before grilling. • Use a meat thermometer to check the internal temperature to make sure all meats are cooked thoroughly. • Use recyclable goods to reduce cleanup without harming the environment. • Remember, safety first! If you are using an outdoor grill, keep children away from it and always keep a bucket of water handy. • Put Frank’s RedHot on everything. It is the perfect condiment on any of your summer favorites from chicken and ribs to burgers and hotdogs. It’s even great on salads and slaws. 1. BAKE wings in foil-lined pan at 500°F on lowest oven rack for 20 to 25 min. until crispy, turning once. Tip: You may substitute 1/2 cup FRANK'S® REDHOT® Sauce mixed with 1/3 cup melted butter for the Buffalo Wing Sauce. Deep-fry at 375°F for 10 min. 1. MARINATE steaks in Frank's RedHot Sauce in deep dish. Cover and refrigerate 1 to 3 hours. Drain and season as desired. 3. LET steaks rest 10 min. before slicing. Splash on more Frank's RedHot Sauce to taste. 2. Layer chicken mixture and cheese on 4 tortillas, dividing evenly. Top each with second tortilla. 3. Cook about 3 to 5 minutes on an electric grill pan or barbecue grill until toasted and cheese melts. Cut into quarters to serve. Serve with blue cheese salad dressing and additional Buffalo Wing Sauce. The distinctive flavor of Frank’s RedHot is also why people keep coming back for more. It all started 80 years ago when Jacob Frank, the founder of Frank’s RedHot, began experimenting with Louisiana Sunlongs, a special strain of cayenne peppers that offers a zesty full-bodied taste. The unique essence of these special cayenne peppers is then combined with vinegar and spices, and aged to perfection. The result is history: the perfect blend of heat and flavor for almost a century and counting. Frank’s RedHot is the secret ingredient used in the original Buffalo Wing created in Buffalo, NY in 1964. 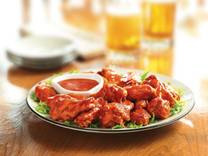 For more recipes with the original Buffalo flavor of Frank’s RedHot log onto www.franksredhot.com.